Scientists working in the Lukina Jama–Trojama cave in Croatia — one of the 20 deepest cave systems in the world — have unearthed a completely new species of snail that's adorned with a beautifully shaped, dome-like translucent shell. 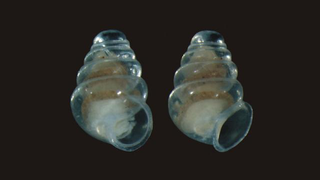 Called Zospeum tholussum, the fragile snail was found nearly a kilometer (3,215 feet) below the surface in a chamber full of rocks, sand, and a small stream running through it. The newly described species is a true cave-dweller (an eutroglobiont), one that has lost its visual orientation. All snails belonging to the Zospeum group have lost their ability to move. But their presence near muddy habitats and natural drainage systems suggests that these animals are not entirely immobile. The Lukina Jama–Trojama cave system is extraordinary on account of its vertical shape, long pits, and an extreme depth of 1,392 meters (4,567 feet). And in fact, the cave is so deep that it features three microclimatic layers: an icy entrance at temperatures hovering around the freezing point, the middle section with temperatures up to 2 degrees Celsius (35 degrees F), and a third, bottom section with temperatures reaching 4 degrees C (39.2 degrees F). These features are of interest to scientists as they have created unique biodiverse environments. Read the entire study at Subterranean Biology: "New Zospeum species (Gastropoda, Ellobioidea, Carychiidae) from 980 m depth in the Lukina Jama–Trojama cave system (Velebit Mts., Croatia)"
Images: Alexander M. Weigand, Jana Bedek, HBSD, and J. Bedek.